Every year, Omega introduces a new limited edition of – in my humble opinion – the nicest chronograph ever, the Speedmaster Professional. It is one of the few watch brands, or perhaps the only brand, that gets away in my book with all these limited editions. This year, it was 40 years ago that Omega accompanied the crew of Apollo 15 to the Moon. The Apollo 15 Mission, that started on the 26th of July 1971 and safely returned on the 7th of August in 1971. On the 30th of July, the crew landed their Lunar Module on the surface of the Moon, to stay there for 4 days. This page on Wiki has a great and detailed description of the Apollo 15 mission. As you can see, Omega used the mission patch as an inspiration for the design of the Speedmaster Professional Apollo 15 dial. Not only the outer part of the dial has the colors of the patch, also the sub dials received the mission’s colors. In the past, Omega has used the mission patches for the sub dial at 9 o’clock (more about the patch models can be read here), different dial colors (white dial) and different engravings in the case to commemorate a NASA mission. 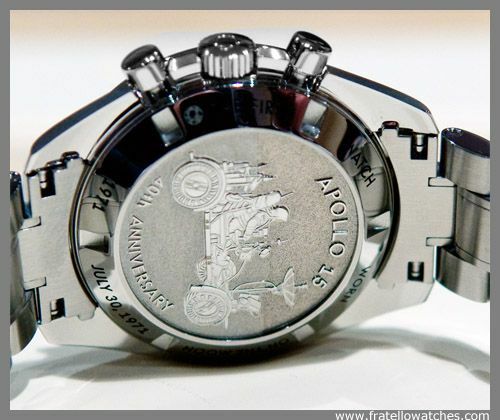 Personally, I love all of the Apollo limited editions, especially the Apollo 13 limited edition with the Snoopy patch on the 9 o’clock subdial and the Snoopy image on the case back. This Apollo 15 could perhaps be my second favorite mission Speedmaster. The red, white and blue colors are used in a way that it doesn’t dominate the watch that much at all. The best part is on the case back though, a superb engraving of the Lunar Roving Vehicle. Underneath the case back, you’ll find the good ol’ Lemania based chronograph, known as Omega caliber 1861. Although Omega has been introducing their new in-house movements, such as caliber 8500 and 9300 (chronograph), the Speedmaster Professional will remain a hand wound watch. 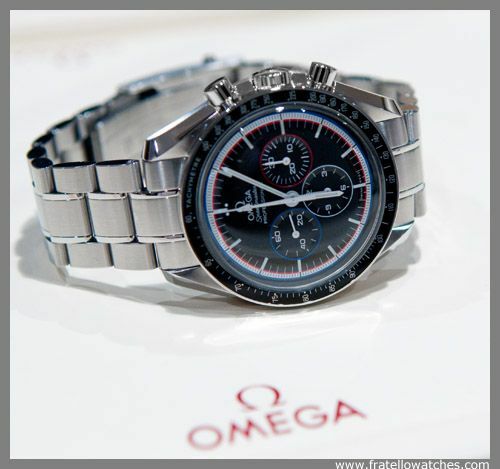 Omega is currently delivering this watch – introduced during BaselWorld 2011 – to all their authorized dealers. Among them is Ace Jewelers, friend of this show, who received their first Apollo 15 Speedmaster Professional last week. This Speedmaster Professional Apollo 15 is limited to 1,971 pieces only and retails for 4.250,- Euro or $6052.00 USD. Visit the official Omega website for more information, or visit their Facebook page.